Chrysoptilus bennettii A. Smith, 1836, western Transvaal, South Africa. Two races recognized. English: Specklethroated woodpecker, Reichenow's woodpecker; French: Pic de Bennett; German: Bennettsspecht; Spanish: Pico de Bennett. About 9.5 in (24 cm); 2.2-3 oz (61-84 g). A small, brownish yellow woodpecker with heavy spotting on underparts; male has a red forehead to the nape, a red "moustache," and white ear coverts; female has a red nape, black-and-white mottled forehead, brown throat and ear coverts, a buff wash on the breast, and less intense spotting on the underparts; juveniles are darker above and more spotted below, with a white-spotted black crown. Lake Victoria region, western Tanganyika and southeastern Congo to Angola, central Kalahari Desert, Damaraland, southern Zimbabwe, and Transvaal. 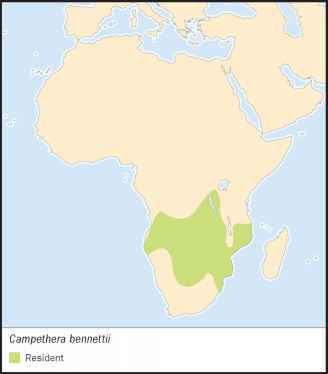 C. b. bennettii, most of range except for southern Angola, southwestern Zambia, northern Namibia, and northern Botswana; C. b. capricorni, southwest parts of range including southern Angola, southwestern Zambia, northern Namibia, and northern Botswana. Absent from large areas. Uses a wide range of open forest and bush habitats, especially acacia, miombo, and Brachystegia. 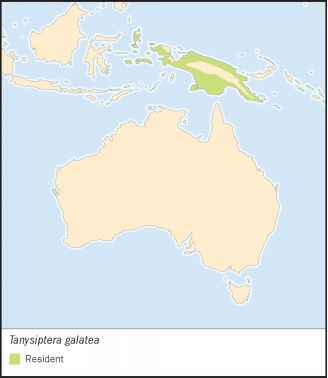 A territorial, but social species found in pairs or family groups. Much of its time is spent on bare ground or in short-grass areas, including lawns. May show some migration in drier parts of its range. Highly terrestrial in its search for food, but also forages on low trunks and larger limbs of trees. Often accompanies glossy starlings (Lamprotornis) when foraging. Diet includes mainly ants, termites, and their larvae and pupae, but also other arthropods. Monogamous. Breeds from August to February, with nesting peaking in October and November in Zimbabwe and Transvaal. Nests are often in open areas and often in cavities excavated by other species. Clutch size 2-5 eggs; incubation lasts 15-18 days; parental duties carried out by both parents. Nest cavities may be reused.